On November 18, 2012 the CME Globex trading day will be revising their trading hours for equity index products (e.g. ES, NQ, YM, etc.). To update your NinjaTrader to the new trading hours is just a few short steps in adjusting the "CME US Index Futures ETH" session template to the new hours shown below. Please see this video tutorial on how to update your session template. Please be sure to make a copy of the current session template as seen in the video if you wish to view data prior to November 18 with the current session template. When charting impacted instruments on data prior to November 18 you should utilize the new copy of the current session template (“CME US Index Futures ETH2”). 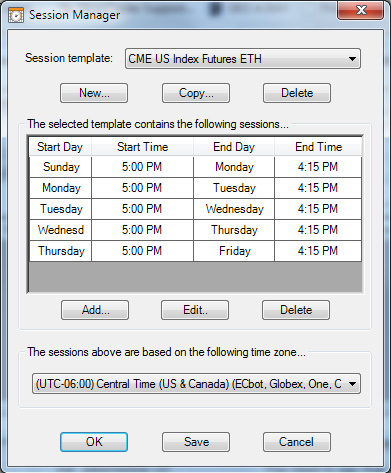 Utilizing the updated session template (“CME US Index Futures ETH”) on this data will result in showing an inaccurate trading day since it would be charting the wrong hours. To chart data that has dates prior to and after November 18, it is recommended you use the updated “CME US Index Futures ETH” session template with the understanding that older dates would have their data slightly shifted amongst the trading days. There will also be a brief 15min truncation of data that used to exist between 4:15PM to 4:30PM. When backtesting impacted instruments on the ETH hours, for the most accurate result NinjaTrader recommends backtesting dates prior to November 18 with the “CME US Index Futures ETH2” session template. For dates after, you should use the updated “CME US Index Futures ETH” session template. If you have any questions or concerns about this change please feel free to contact us at [email protected].